In Twelve a Dozen, you need to transform the main character into different numbers using various arithmetic valves to unlock new paths. I always believe that kids learn best when they play. And, one of the best ways to learn math is by playing puzzle adventure games designed to teach specific math concepts. Two of my favorite math games in this category are Slice Fraction and Dragonbox Elements. The first game is designed to teach fractions, whereas the latter is designed to teach geometry. Today, I will add a brilliant platform adventure game to this collection, called Twelve a Dozen. It’s a game designed to teach arithmetic. In it, you try to solve puzzles and help Twelve rescue her family. In a universe where numbers live together, a cataclysmic event caused our heroine, Twelve, to be separated from her family. To rescue them, she leaves her home town Dozenopolis. Accompanied by her friend Dot, she will collect the scattered "numbles" and manipulate them inside arithmetic valves to open paths that can take her closer to her goal. The game will introduce the arithmetic valves gradually, starting from addition and subtraction to multiplication and division. The valves take two operands and can only be used a limited number of times. But, that’s not all. You can also unlock hidden powers in the digits. For example, a number containing a “4” can push obstacles out of the way, whereas a number with a “9” can jump higher than normal. You will be playing with 32 levels of brilliant puzzle platform adventure game that force you think and plan ahead. Twelve a Dozen is suitable for kids ages 8+ who are learning the basics of arithmetic operations. The developers mentioned that it was developed in conjunction with math teachers to ensure that its design and content complement the classroom experience in an engaging way. The game features voiceover by English comedian and actress Lucy Montgomery. Her excellent narration will accompany you throughout the game, feeding you the storyline without forcing you to wait for her to finish. When you’re idle, she will provide you with tidbits about the story. I really like the background story in this game. Instead of sending you on a series of small-scale missions, you’re actually in a great journey trying to save the world from The Ultimate Prime. What is even more interesting is that the game doesn’t portray math as the obstacle; instead, math is the key to accomplish the goal. Twelve a Dozen also has stunning art and excellent music. I’d recommend playing the game with headphones on for maximum experience. Another thing I like is the thoughtful game design. 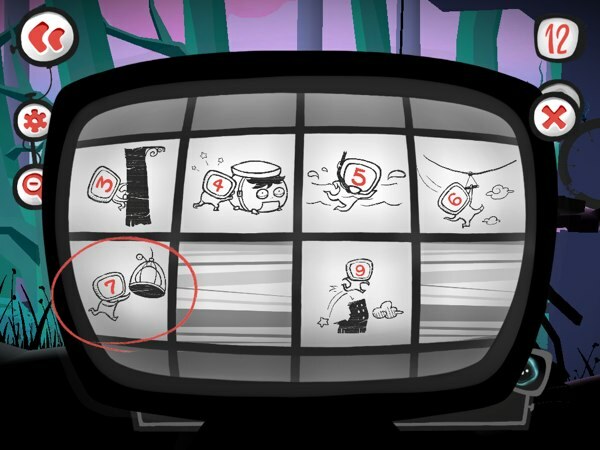 Because a level consists of several puzzles played sequentially, the output of the previous puzzle becomes the input for the next puzzle. This really challenges you to plan ahead and think things through. A “4” can push the obstacle that is the gruffletrump. You will need this power to clear a path from a gruffletrump; push the gruffletump to a specific location and use it as a stepping stone; or push the gruffletrump to block the falling rubble. A “9” lets you jump higher than normal. A “5” lets you swim. A “3” lets you climb special purple walls. A “6” lets you slide down a cable line. A “7” lets you open cages that imprison numbles. Plan your moves ahead of time. Use the zoom-out button to get an overview of the puzzle. Almost all of the puzzles have only a single solution. Each arithmetic valve can be used a limited number of times, as denoted by the number of light bulbs on it. Think things through, including which numbers you would use with the different valve. In the later stages, you can use the Forest Beast to combine three operands into a new number, thus reducing the burden on the arithmetic valves. The beast can sum or multiply three operands with a single move, but it doesn’t directly affect Twelve. Instead, it will produce a new number to replace the three numbers you feed it. The hidden powers work on digits, thus you can combine the digits to have two or more powers at the same time. For example, “14” has the same power as “4”, whereas “49” has both the powers of “4” and “9”. When there are too many options, it helps to find out which number you should transform Twelve into. You can identify this by looking at the green panels or the terrains that you need to go through. For example, if you know that you will need to swim across, find a target number that has a “5”. Once you have identified the target number, it’s easier to work your way backwards and define how you’d want to transform Twelve. There are a few things that can make you die in this game: spiky thorns, swimming when you’re not a “5”, falling rubble, and running into Zeroes. Fortunately, you can use the rewind button to undo your previous actions. If you’re stuck, Dot is always ready to help. Just tap on the Hint button and she’ll show you where to go. I’m really impressed with the design and gameplay of Twelve a Dozen. I’d argue that it’s one of the best iPad apps for kids in 2014. Both my kids are very excited to play the game with me even though they’re still too young to solve the puzzles on their own. I’d highly recommend this app if you have kids ages 8+ who love to play platform adventure games. They will learn a lot about arithmetic without even realizing it.